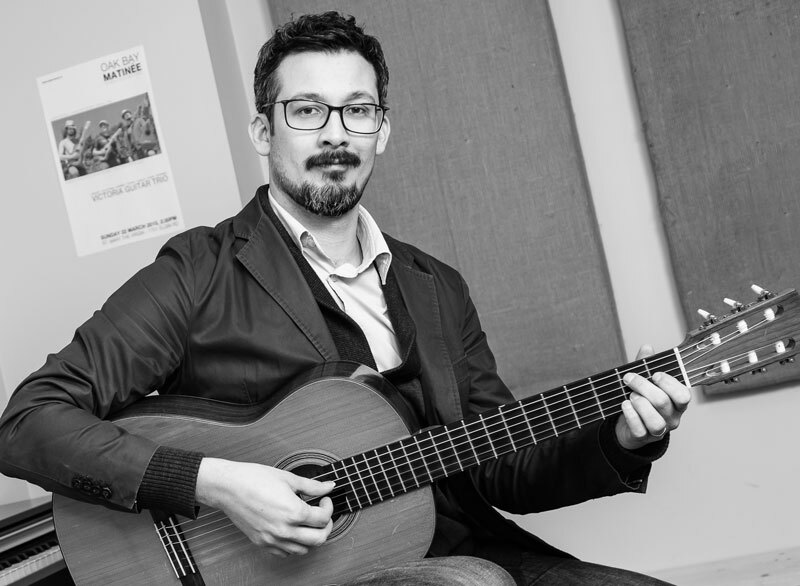 An interview with Michael Dias, founding member of the Victoria Guitar Trio | Oak Bay Music: Chamber Music Concerts Victoria B.C. Victoria guitarist Michael Dias sat down for an interview to tell about his own musical background, the Victoria Guitar Trio, and program they are going to perform on March 22 at Oak Bay Matinee. Erik Abbink (EA) Tell me about how you started out on the guitar. At what age did you start? Michael Dias (MD) My dad played the classical guitar. He took it up when he was going to college and always tried to teach his kids. But, at the time, it never really worked out: it’s hard to teach your own kids! But, something obviously stuck. I took piano for about 4 years when I was 8. I quit when I was 12 to take up the guitar. Not classical guitar, but folk rock. Like Paul Simon, Simon and Garfunkel, Led Zeppelin and that stuff. My dad had always subtly pushed the classical guitar. So, it was like I had been practising without knowing it. I had all the technique and note reading when I seriously decided to study the classical guitar when I was 16 and I decided to do a degree at 19. EA: Having had your dad introducing you to classical guitar playing suddenly became a big advantage. MD: Exactly, yeah. I am not exactly self-taught, but also never really had guitar lessons when I was younger. But, because my dad was always around playing, I learned by osmosis. EA The first time you played the guitar on stage, would this have been with one of your folk-rock groups? MD It would have been in piano. I loved the piano. But, at a certain point we moved and I had to switch teachers. My new teacher wanted me to learn scales, technique, and do exams, and my other teacher was not like that. In hindsight, I think it was the wrong age, when you’re 12, to make demands like that. So, I just quit. So, performing in public on the guitar wasn’t really something I did until I played with some casual folky groups for open mics in high school. We did things like the Grateful Dead and Led Zeppelin – folk rock stuff. EA So, how was performing with these groups for you, how did it feel, and at what point did you decide performance would be something worth pursuing? MD I went to university first for biology. I did three years of a biology degree at the University of Calgary. But, I would always walk through the music building to get to my classes. I think it was just doing that – being around the music building there and seeing people practice that inspired me. It was amazing to me that while I was memorizing all 26 amino acids (which was some really hard stuff), other people would be studying how to play music! EA So, at some point you switched, from biology to guitar. MD: Yes. I took a few months of lessons to prepare for the audition. I auditioned and I got in. EA Let’s talk about the trio. How did you guys find each other. That’s not always the easiest thing to do, as a classical group, to find people that are compatible with one another, and stay together for a little while at least. MD Exactly. Well, Brad and Adrian knew each other from going to a music school in Vancouver. They were also roommates when they came to study in Victoria with Alexander Dunn. A few years later we were all faculty members at the Victoria Conservatory of Music. We decided to do some one-off pieces here and there, and eventually decided to do a full concert. That was in 2007. We did our first concert in St. Mary’s church in Oak Bay. EA Oh, nice, so you have a history there. EA Is it very common for guitarists to play together in a group? I personally know the guitar mostly as a solo instrument. How does it work in a group? MD It is true that the guitar is a great soloist instrument. In a group setting, it is actually difficult if you are not playing with other guitarists. Guitar and piano – the piano drowns out the guitar. The guitar when it is accompanying voice, violin, or other instruments, gets drowned out very easily. So, it’s actually a really good balance between three guitars. Guitar duos and trios are way more popular today than even 10 years ago. There are many many, very high-level, professional duos and trios, as well as quartets. EA It’s up and coming? MD Yes, up and coming, exactly. EA So you are at the forefront? MD I think so. We’ve had three pieces written for us and we’ve explored a lot of other material that was specifically written for three guitars. A lot of it is complex avant-garde material. So, other trios have come to us, asking questions about how to perform this or that piece. MD This upcoming program is about old and new: very, very old trio music for plucked instruments alongside 20th and 21st century pieces. EA So, getting back to what we were talking about earlier, that trios are up and coming, there’s also a history of playing these lute pieces on multiple instruments? MD Yes, there is a history. So, we are playing some of the oldest published lute trios arranged for guitars, and some of the newest pieces for three guitars. Alot of the modern works were written or arranged by composers specifically for us. There is one piece called Mystic Vale by Benton Roark, which was in part inspired by the Mystic Vale forest outside of UVic campus. We play a piece inspired by Aristotle called On Poetics by Scott Godin. For this piece the composer incorporated each trio member’s favorite music. So, it references music by classical composers Silvius Leopold Weiss, Mozart as well as Radiohead, Led Belly, and Jimi Hendrix. We’re also playing a piece by Vancouver composer Rodney Sharman. EA How did Rodney Sharman’s piece come about? MD We had initially played this guitar trio entitled September (for Morton Feldman) that Rodney had composed in the 1980s, and which we performed for two or three years. We love the piece, but it is very difficult to perform. So, the idea came about that a smaller (and easier) piece by Rodney would be nice. So, I arranged a small interlude from his opera Elsewhereless which is called the “Suspended Waltz.” In the opera, the characters dance to this music which is supposed to come through the radio. So, it works well as a piece on its own. We also play a piece by Vancouver composer Jordan Nobles, a piece originally for four guitars which he arranged for the Victoria Guitar Trio. EA Can you describe the piece? MD Yes. It’s called Temporal Waves because the music never sits still for any one moment. It’s like three oscillating waves moving independently. It’s continually shifting in harmony, texture, and rhythm, but you never notice when these shifts take place. He begins with a certain tempo and key, then cycles through all kinds of different tempos and all the 12 possible keys in music. He finally comes back to the original tempo and key again, but you never really know how he did it, how he got back. EA Do you feature any other plucked-string instruments? MD Yes. We use two other instruments in the guitar family: a terz guitar as well as a guitalele. A terz guitar is a historical instrument from the eighteen hundreds. It is a smaller sized guitar that’s raised up in pitch. The guitalele is even smaller, even higher in pitch, and is a cross between a guitar and a ukulele. We use these instruments for the old piece because many lute trios were meant for three different sized lutes: a big one, medium one, and small one. So, we are basically doing an analogous thing. We use this instrumentation for a piece that features the soprano saxophone, which we are very excited about. It’s an old tune (“Mille Regretz” by Josquin) that a composer in the 16th century used as the basis of a mass for choir. You will hear the sax play the same tune over and over, but each time with a different setting from the guitars. Using the guitalele is a product of long hours on the road when we were on tour. It organically came about because I had brought my guitalele along for some fun in the car. At some point the idea came to us that, in the next show, we should include the instrument somehow. It actually sounds great as a kind of imitation renaissance instrument. So we included it, and now we’ve arranged things for that combination of instruments. EA The program as a whole, how does it fit together? To some, your program might look quite extreme, this juxtaposition between these old pieces and new pieces. MD Aesthetically, the pieces fit beautifully. Even though there’s a huge gap in time between some of the earliest music written for plucked instruments and the latest, the music is actually quite similar in most cases. In Renaissance music you often have a lot of independent voices floating through time. That is certainly also the case with some of the modern pieces we are doing. Rodney Sharman’s Suspended Waltz and Jordan Nobles’ piece have that floating quality. EA That’s wonderful. Is there anything else you want to mention regarding the program or your trio? MD My favorite part of the trio is that we are really good friends. The Victoria Guitar Trio is a result of that friendship. We like to play together, we like to practice together, we like to perform together. We have fun when we play! EA Well thank you for doing this interview. MD Great, it was my pleasure. 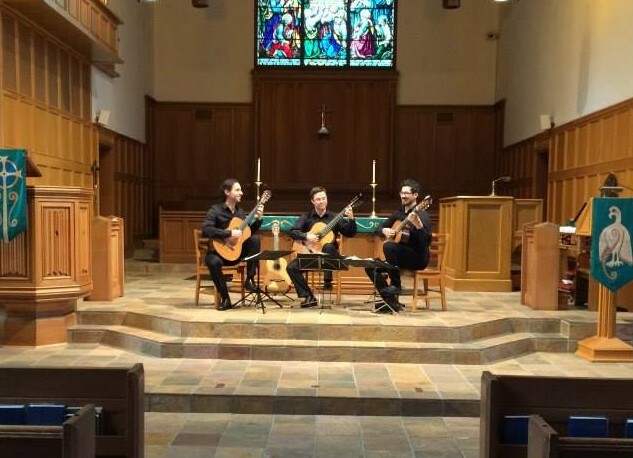 The Victoria Guitar Trio will perform at the Oak Bay Matinee Concert Series on March 22, at 2:30pm at St. Mary the Virgin, 1701 Elgin Rd.